Back in the 1970s, when I was first starting in dogs, I witnessed a demonstration at my local obedience class. Our guest was one of the pioneers in the newly formed narcotic dog detector program being run by the U.S. Customs Service. He produced several tiny boxes containing marijuana and placed them around the room. Then, he introduced us to a big German Shepherd who proceeded to quickly find all the hidden boxes. The dog's enthusiasm and glee when he alerted to his finds had us all smiling. Since then, I've been fascinated in the use of dogs in detecting drugs and other contraband. While the Customs Service does have a breeding program and some owners contribute dogs, the vast majority of recruits come from animal shelters or rescue groups. In fact, the Service has spotters in some shelters that call them when they think they have a prospect. The training program is demanding and for every 100 dogs screened, only one or two are accepted. The Service has had the most success with Labrador and Golden Retrievers, German Shepherds and Belgian Malinois. Dogs have to be fanatic retrievers who are willing to chase and retrieve all day without tiring or losing interest. Dogs must also be intelligent and curious, with an outgoing personality. Additionally, it's important that the dogs have a stable, calm temperament because they will be exposed to crowds of people and the crazy traffic conditions at border crossings. It's important that the dogs remained focused despite all the hubbub. They also have to have stamina since they will be working eight hour days and sometimes even 16 hour double shifts. The dogs undergo a 13 week training program. They will be assigned a human officer who they will remain with exclusively. The dogs are taught to detect marijuana, heroin, cocaine, ecstasy and methamphetamines. In the beginning, towels are scented with the various odors and the dogs are taught to retrieve them. Once the dog has become familiar with this, the towels are placed in sealed containers. Toward the end of the course, dogs will have to detect drugs from hundreds of boxes on a conveyor belt or hidden in cars. Most of the dogs are one to three years old when they start their training. The officer and his dog form a close bond and the longer they work together, the more efficient they become. Dogs can keep working into old age unless some physical problem forces their early retirement. When their working days are over, most dogs are adopted by their handlers. The Customs Service would be lost without their canine officers because the dogs are so amazingly efficient. Imagine how long it would take a human inspector to examine 500 boxes on a conveyor belt. A handler with a dog can accomplish this inspection in about 30 minutes. And the dogs are an absolute must when cars line up to cross the borders. An officer might be able to conduct a basic search of a car in about 20 minutes. In five minutes a dog can examine a car and detect any drugs that are hidden in transmissions, gas tanks, engine compartments or door panels. Dogs have even been known to fix on a scent across 10 lanes of traffic and drag their handlers to the exact car. The dogs have been so successful that Mexican drug lords offered a bounty of $300,000 for anyone who would kill two border dogs, Rocky and Barco. In the early 1990s, the Customs Service began giving anti-drug talks at schools and they would take one of their dogs along to give a demonstration of their abilities. 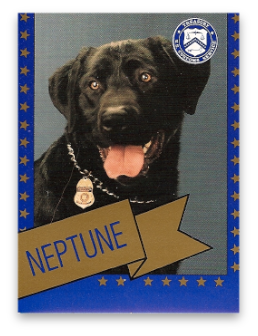 The handlers wanted something that they could hand out to the children and the first trading cards featuring the Customs Service dogs were born. 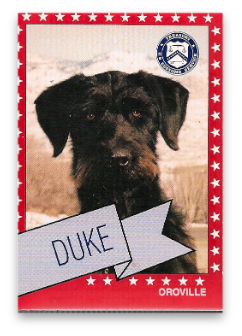 In 1991, the first series of trading cards was released. These came in cellophane packs of nine and there were nine sets comprising 81 cards in all. They also included a Customs Service sticker. 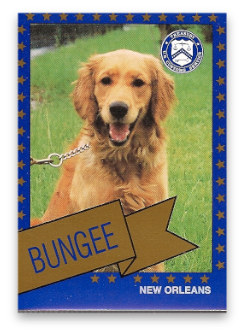 The cards gave the dogs name, the place where they worked, their tatoo number, breed, age, weight, the year they began customs work and their largest or most notable seizure. It also included an 800 number for reporting suspicious activity. A second series of 24 cards was released in 1992. Response was so great that another series of 81 cards, these with a blue border, were released in 1994. Series were also released in 1995, 1996, 1997 and 1999. These later series came in packs of four cards. In 1992, the Customs Service searched for a corporate sponsor to underwrite the expense. Nabisco signed on and one card was included in Milkbone boxes. I do not know if they sponsored the subsequent series. These cards launched a collecting craze when they came out in the 1990s. The Customs Service repeatedly said that this was a non-commercial venture and that they wouldn't sell the cards. That didn't stop others from selling them. One man even went public with his search, offering $500 for a complete set. 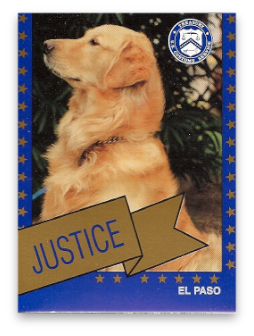 Some people began to collect cards which featured a certain breed, while others aimed for cards showing dogs with the highest seizures or those who worked in their hometown. 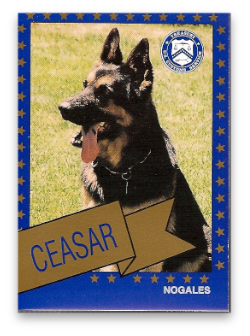 For me, collecting these cards is a marvelous tribute to the abilities of our dogs. Oh, and did I mention it? It's been great fun, too!